PetExpert Hands Free Dog Leash is designed with the greatest degree of precision and care for pet owners that love being active and spending time outdoors.the belt inlay provides perfect support for your back while the leash handle prevents tried hands,so you can stay active and healthy for longer. PetExpert premium hands-free dog running leash comes with a handy and functional waist belt,You can attach the heavy duty dog and puppy leash on the running waist belt and make sure that you enjoy a hands-free dog walking experience! PetExpert unique hands-free dog walking leash set is going to become an instant hit with all your dog-loving friends!Especially those who also have little kids and had trouble walking their dog and holding their kids' hands at the same time! With PetExpert premium quality products,you are ready to set off for new adventures with your pet! HANDS FREE: With the waist wearing,you can freely use your phone or read a newspaper without feeling restrained by your dog's movements. EXTRA CONTROL: With the extra handles can guide your dog without breaking stride via the built-in waist handle; get more direct control and prevent dog fights with the collar's handle. FIT FOR ALL DOG SIZES: Experience an adjustable hands free dog leash belt suit all dogs no matter their size. 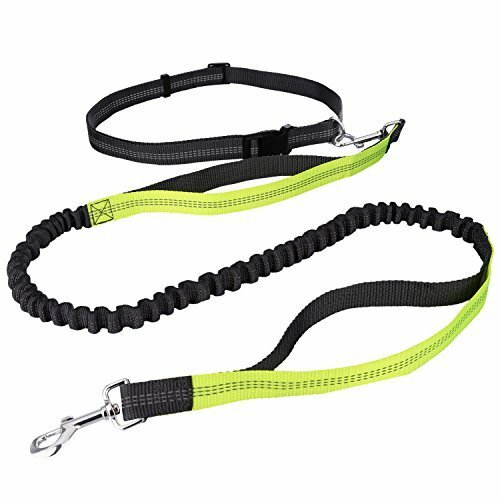 RELFECTIVE SITCHING FOR NIGHT USE: Benefit from extra safety at night with the luminous reflective stitching; enjoy a hands free dog leash for running that provides added visibility. If you have any questions about this product by PetExpert, contact us by completing and submitting the form below. If you are looking for a specif part number, please include it with your message.